The American Folk Art Museum in New York is displaying an extraordinary collection of quilts, all made by men from military fabrics. These quilts are the private collection of Australian scholar Dr. Annette Gero. They have never before been seen in this country. Most are made by skilled but nameless craftsmen, by active soldiers, veterans, and bedridden wounded men. One dates from as early as 1719. Each one is a work of stunning originality, unlike any other quilts anywhere. Some are appliqued and beaded, and many use unusual techniques such as intarsia, felting and various overlay techniques. 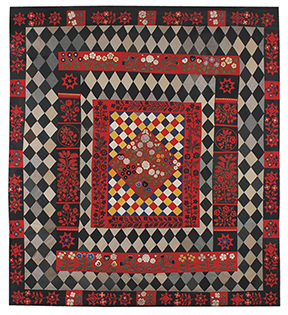 Richly colored and intricately patterned with stunning geometric designs, this collection has been drawing lovers of quilts, connoisseurs of rare textiles, and those with an interest in military history to the Folk Art Museum on Broadway. The collection is impressively global in scope, with quilts from the U.S., the Crimea, Britain, Central and Eastern Europe, Turkey, and India. Many of the quilts on view reference the Crimean, Prussian and Napoleonic wars. They demonstrate the creative aspect of men at war. An impressive book, Wartime Quilts, written by Annette Gero and published by The Beagle Press, complements and illuminates the exhibition. The collection is on view until January 7. Organized by the museum, the exhibition was co-curated by Stacy C. Hollander and Dr. Annette Gero, in collaboration with the International Quilt Study Center & Museum, University of Lincoln-Nebraska.